From Goodreads: Queen Clara has chosen her future king but as the Wedded Joining draws nearer, the Kingdom of Kentucky’s sphere continues to degrade. Relations with the outside are non-existent and the beleaguered people housed within the confines of the kingdom will soon be loosed to join the fragment. Calia and Evie join forces to escape the plan that Edwin has for Calia’s future. Frantic to locate the women, Maddoc, Jonathan, Philip and Daniel join forces to cinch the net of safety around the pair before it’s too late. Calia doesn’t long for a future where a male is the answer. However, when biology and destiny collide, she will find the choice that she wants the least, may be the correct one. Will Calia be allowed to remain true to herself by protecting those she has vowed to defend? Can she overcome her past and be healed by the love of her one, true soulmate? This is another beautiful novel written by the ever talented Tamara Rose Blodgett. 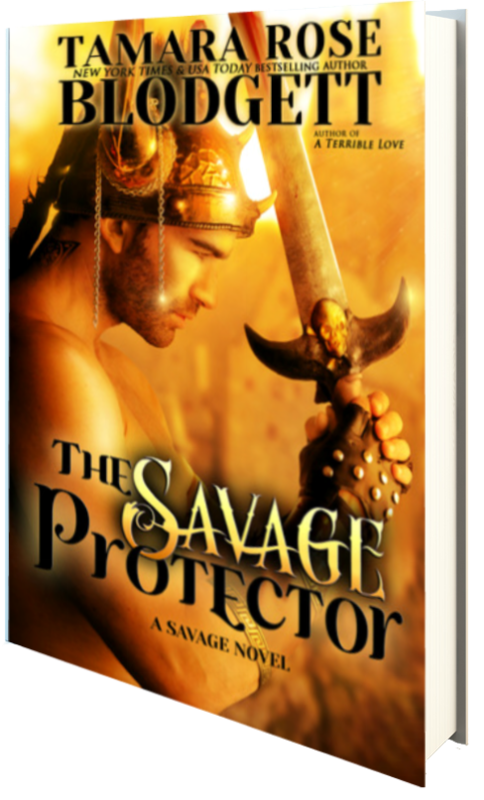 Her ability to captivate readers with not only her storyline, but also her imagery, characterization, and intense action sequence always makes her novels a joy to read, and The Savage Protector is no different. I was drawn into this fifth novel in the series from the very first page, and as Blodgett continues the perilous story of Princess Clara, the band, the spheres, and the fragment, I was riveted to the spot. I absolutely adore the writing in this series. A bit archaic in nature, this world Blodgett has created is beyond amazing, and she designs it perfectly, from the clothes and character mentalities to the language and mannerism, it flows off the page in perfection. And the imagery? Wow. I don’t usually reflect on the writing in novels–I usually am too wrapped up in the story itself, but in Blodgett’s novels, her writing flows so beautifully that it’s impossible not to notice, and on many an occasion it brought me up short, going back and rereading the beautiful imagery Blodgett presents, even in the more dire of situations within the text. It is just beautiful, and this, mixed with the heart-pounding sequence of events, is definitely a must read. I also love the way Blodgett intertwines her story, shifting between character viewpoints throughout the novel. Though the entire novel reads in third person, events unfold simultaneously, which creates the need to follow different characters on their perilous adventures throughout the story, bringing each separate entity back to the main story and intertwining them perfectly. While this is indeed the fifth novel in this amazing series, and I do suggest reading these novels in order, all the novels in the Savage series read as beautifully as this, and I highly suggest you start from the beginning if you have not already done so. Five stars. And, if you haven’t yet read any of this series, make sure you pick up the first three books, which are currently FREE at the time of this post.